The housing market is in turmoil, but if there’s a silver lining, it’s the fact that purchase prices are at historic lows. Sure, there are still plenty of predatory lenders waiting to exploit the naïve potential buyer, but those who do their homework will be rewarded with a fair price and manageable mortgage terms. Decoding the New Mortgage Market is a map to finding the best and most realistic mortgage deals while navigating past potential obstacles and traps. Filled with money-saving advice, this practical guide will help prospective buyers understand: • How new lending and underwriting rules affect today’s homebuyer • Different loan types and lending institutions • Credit issues and other qualifying factors • Creative down-payment solutions • How to reduce closing costs and other fees Because lenders and buyers alike have gotten “burned” in the mortgage crisis, finding and qualifying for a manageable loan may now be more difficult. 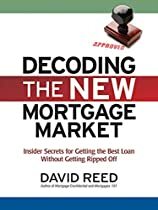 Readers will find that Decoding the New Mortgage Market makes the search both easier and more fruitful, and that their dreams of home ownership are still within their reach.